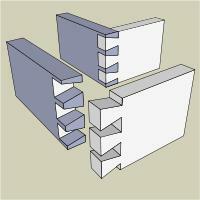 Dovetail Joint - A joint where a mortise and tenon combine to for a solid structure. Created entirely from wood. Dovetailed woodworking joint on a Romanian church. The end of a dovetailed joint. A dovetail joint or simply dovetail is a joint technique most commonly used in woodworking joinery including furniture, cabinets, log buildings and traditional timber framing. 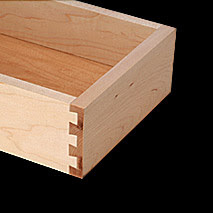 Noted for its resistance to being pulled apart (tensile strength), the dovetail joint is commonly used to join the sides of a drawer to the front. A series of pins cut to extend from the end of one board interlock with a series of tails cut into the end of another board. The pins and tails have a trapezoidal shape. Once glued, a wooden dovetail joint requires no mechanical fasteners. 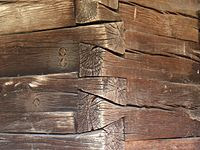 The dovetail joint probably pre-dates written history. 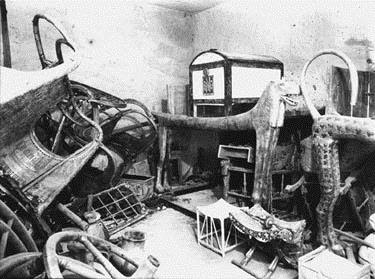 Some of the earliest known examples of the dovetail joint are in furniture entombed with mummies dating from First Dynasty of ancient Egypt, as well the tombs of Chinese emperors. The dovetail design is an important method of distinguishing various periods of furniture. 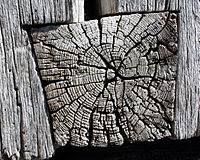 In Europe the dovetail joint is also called a swallow-tail joint or a fantail joint.